natomy Physiology are vast subjects, Learning the structure of each and every part of the human body a daunting task is impossible. This book is made especially for paramedical students. It contains anatomy physiology in combination. This book contains simplified version of all the major systems of the body and it is hoped that this will be beneficial for all paramedical students. The text is simple and the line diagrams are easy to follow. We have tried to present a comprehensive overview of anatomy physiology required by paramedical students. We have also added a section of question bank to make the book a complete guide for students and hope that this book will be of great help to them. Anatomy is the study of basic anatomical structures assisted with microscopes which includes histology study of organization of tissues and cytology study of cells physiology the study of functions are complementary basic medical sciences when applied to human body. Human body consists of biological systems that consists of organs, tissues cells and connective tissues. Some of the salient features of the book are a It is presented in a simple and lucid language, b In order to make learning easier, the book has been provided with simple labeled diagrams. 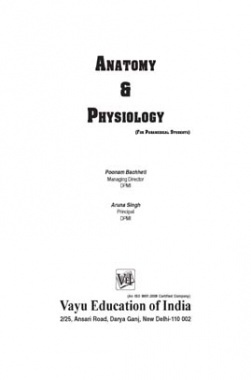 Authors of the book are immensely grateful to the Management, HOD Paramedical Sciences and Paramedical Faculty of the Institute for their constant encouragement, relentless efforts, devotion and invaluable guidance and contribution for the initiation and laying ground in the preparation of this book 'Anatomy Physiology' for Paramedical students. Authors also feel pleasure in acknowledging the valuable contributions of M s Vayu Education of India, Darya Ganj, New Delhi., for elegant printing and publishing of this book. The technical help rendered by Ms. Jyotsna Tiwari, Sr. faculty, Dep t of Anatomy Physiology in preparation of this manuscript is gratefully. Suggestions if any for the improvement of this book will be highly appreciated.